11/30/06 Laila died suddenly overnight last night and we will be doing a necrospy to try to setermine what happened. She had just come to us from the shelter. May she rest in peace. Hi. My name is Laila. I am a gorgeous, big, spayed girl with a real love of life. I enjoy doing bunny dances and bunny binkies and I'm pretty graceful if I do say so myself! I was at the San Francisco shelter for a long period of time and my time recently ran out, because of shelter overcrowding. I was really happy to be rescued, because I have a strong will to live. I really enjoy having my freedom in a bunny-proofed area and getting a lot of attention. Please fawn all over me and make a fuss about how lovely I am! 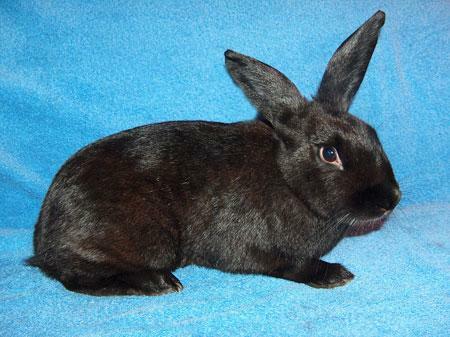 Did you now that black bunnies like me and white rabbits are some of the hardest rabbits to find homes for? People discriminate against black and white rabbits and don't think they are cute. Isn't that sad? So unfortunately, black and white rabbits are euthanized at shelters more often than other types of rabbits, because no one wants them. We are actually some of the nicest bunnies around! We really wish people would pick their bunny companions based on personality, not on superficial looks. It would save so many lives of great bunnies. Anyway, my point is that I am a real catch, so please visit me soon!